I don’t know who these boys are, but the place has the feel of Cedar Lake to it. I see a fence on the left that’s going off into the water. I vaguely remember something like that from the half-dozen or so times I went to the lake. The boy on the right has on a Boy Scout T-shirt, but I don’t recall ever going out there with Troop 8. If I recall it correctly, you’d pull up to a farmhouse and pay to fish. They must have had boats for rent. Jim Stone, Lila, someone else and I went out there once, and there’s a photo of Lila and me in a boat floating around (pardon the pun) somewhere. I don’t know if we rented it or if we just sat in it for the picture. This Google Map looks like the lake hasn’t changed much in the last 45 or so years. I’m surprised that there aren’t houses sprouting up all around it yet. I’m glad it looks pretty much like it always did. I’ll have to take a drive out there on the next trip home. This may or may not have been close to the bridge where kids would cheat death. The best place for swimming in olden tymes was on the road to Cedar Lake at Millersville on the White Water. We used to go up there and swim as a kid. Joe McNeely our neighbor and younger brother of Channel 12’s Don McNeely often went with us on these trips. Ken, unfortunately I can’t identify the boys or location. I had never been to this Cedar Lake. It is not very near the Twin Bridges area. If you expand the Google map so that you can see Highway 34, you have to follow it west until you pass Grassy. There you will see the Castor River bottoms where the Twin Bridges were. I think you’re right about the bridge. I just tossed the link in because I figured that anybody who made it to Cedar Lake was probably somebody who would jump off a bridge. Ken, this is indeed Cedar Lake. My grandparents, Truman and Eula Statler, owned and operated the lake from the late 1940’s (when it was built with the assistance of the Missouri Dept of Conservation) until the mid 1960’s when it was sold to the John Monroe family. Not sure who owns it now. Truman and Eula, in addition to being full time farmers, operated the lake, kept it stocked, rented boats, sold fishing supplies–even operated a limited restaurant for a time—later a snack shack. You could buy a season pass or fish all day for a dollar. To my knowledge, it has remained in private ownership–hence it is still very much like it was in the 1960’s when most of my memories were made. There was also the “swimming hole” nearby on the Whitewater River as described earlier. As I recall, the lake was drained for a time, owing to some problem with the dam, but I can’t remember the year. 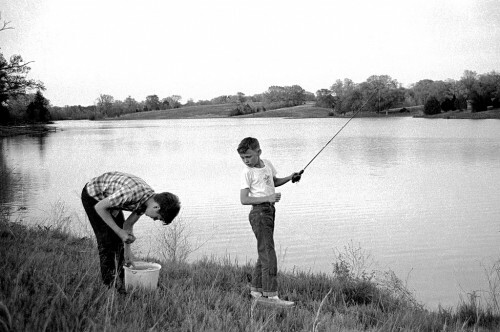 I do remember one day when my Dad tied into the biggest bass either of us had seen…unfortunately he did it on a flyrod. It was no contest…the big brute cleared the water once and was gone. I rode my bike over there today — it’s not easy to get a view of the lake; only one spot on a gravel county road. Apparently the current owners are keeping it to themselves. I remember when Cedar Lake was public access. We even had Sunrise services there prior to John Monroe invading the area and making it a private lake. It held many joyous memories for people in the area. My older brother and his friend would scrape their money together to rent a boat for the day so they could go fishing. The bluff hole which had cliffs where the brave dove into the river is just a few hundred feet from there. Still a beautiful unspoiled lake. Does anyone happen to know how many acres is it?